I volunteered in Nepal for two weeks, as part of Anglia Guides group, in the summer of 2014 and it is easy to say that it was the most diverse, exciting and tiring weeks of my life. After two flights, security screenings and interrupted sleep, we arrived in Nepal. The airport was much smaller than Heathrow or Dehli and it did not take long to get through security and immigration. We collected our bags and headed outside, ready for our adventure. Just by walking from the airport to the minibus, it was clear that Nepalese road rules were a lot different to that of the UK. On our journey, we saw all modes of transport: bike, moped, minivan, tuck-tuck, taxi and bus/minibus. The Nepal roads are lined with people in their various vehicles with everyone honking their horns! We stayed at Hotel Excelsior which was full of really friendly and welcoming staff, delicious food, but lots of steps to get to our room; we were much fitter by the end of our stay. All our needs were catered for allergy wise, but also if we ever had any problems there was always someone on hand, including the ever cheerful receptionist, Navin. The majority of our time was spent at Zing Secondary School on the outskirts of Kathmandu; although the name suggests otherwise. When we arrived at the school we were greeted with an amazing welcome from the children. They gave us flowers, scarves and tilaka (a red powder). The main part of our project was to improve the schools environment through painting the classrooms and benches. The classrooms are all small and were quite grubby. We started in one classroom, built from breeze blocks, we painted the walls with two white coats and they already looked much better. We then moved on to another classroom built from bear bricks, so painting this was a lot more difficult. By the end of our time in Nepal, we had painted twelve rooms, eight of which had mural in them of the following themes: guiding, beach, under the sea, space, farm, jungle, nursery and mountains/elephants. In the jungle room we completed a peacock, whose tail was made from our handprints. We finished by painting our names around it. 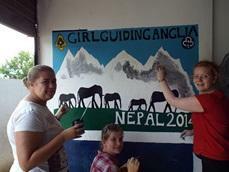 We also painted the Union Flag and Nepalese Flag on the outside of one of the classrooms. As well as painting and improving the general school environment, we also ran activities for the children one afternoon. We started off with singing the Hokey Kokey, Heads Shoulders Knees and Toes and Get Loose. We then split the children into groups (age 4-8, 9-12 and 13-16 years old). I was with the very young children and we sang songs, played with a homemade parachute (made from a cut open duvet cover) and made creative pieces with colouring pencils. Colouring was manic. We started off with a few children (perhaps 10) and ended up with at least 50. There was constant demand for paper, colouring pencils and pencils (as they all wanted to draw their picture out in pencil before colouring it in). At the end many of the children gave us back their pictures, mainly of their homes. Another afternoon we participated on a dental outreach programme. After lunch we started to organise the dental outreach for 175 children of the school. We had four groups of children ranging from 5 year olds to 15 years olds. Each child got a toothbrush and a tube of toothpaste. We took it in turns to lead each session including an amazing song some of the members of our group made up about brushing your teeth to the tune of Frere Jacques. As well as some really rewarding and tiring times working at Zing school, we enjoyed some fantastic trips. Our first weekend was spent visiting Chitwan National Park. This is an excerpt from my diary for one of the two days we were there. We then arrived at the elephant breeding centre. We saw baby and adult elephants, including one elephant sleeping on its side. After our tour we returned to the hotel, freshened up and played cards before lunch. As well as an amazing trip to Chitwan we spent a day visiting some of the Kathmandu sights. We travelled to the Swayambhu temple (also known as the monkey temple) looking over Kathmandu. We all had to leave our bags in the car to stop any monkeys coming and attaching us searching for food. The temple was amazing. There were prayer flags draped from every point and the architecture was also stunning. We looked round the temple in a clockwise direction, which according to Buddhism is lucky. We walked up to the main stupa which was white with an amazing face on the top of the Buddha’s eyes. The place filled with prayer wheels, which will bring you good luck if you spin them in a clockwise direction. Overall my trip to Nepal was amazing. The country is beautiful and really different to the UK. The work we did was actually making a difference and the experience is something I will never forget.